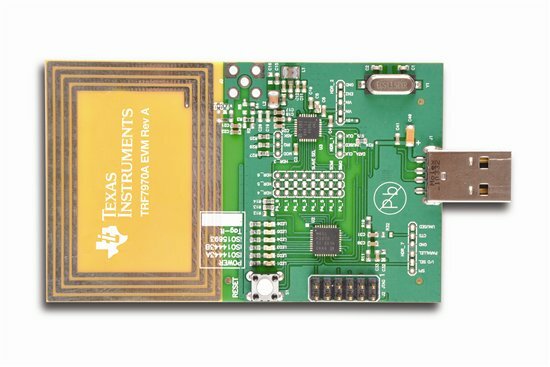 Texas Instruments has announced availability of the new TRF7970A NFC (near-field communications) transceiver, which they claim offers the industry’s lowest power, extending battery life "up to 2 times longer than competitive products" by virtue of eight selectable power modes. TI is also offering royalty-free software stacks for the TRF7970A to developers, which they say are compatible across a broad range of the company's MSP microcontrollers. Power modes range from 1 µA to 120 mA. Supports peer-to-peer communication, reader/writer capability and card emulation. Supports two crystal oscillator frequencies: 13.56MHz or 27.12MHz frequencies give engineers more flexibility in speed and cost options for their designs. 128 byte FIFO buffer for NFC communications allows developers using microcontrollers with low MHz to create products capable of handling large data transfers. Compliance with ISO/IEC 18092 and ISO/IEC 21481 standards gives developers the ability to create globally interoperable products. NFC Peer-to-Peer Initiator as well as Active and Passive Target Operation are available for MSP430™ microcontrollers. Supports multiple reader/writer protocols and includes demo software stacks for reader/writer mode ISO/IEC 15693, ISO/IEC 18000-3, ISO/IEC 14443A/B and FeliCa. that will launch in the U.S. with the Samsung Nexus-S smartphone on Sprint. TI is targeting the TRF070A at infrastructure devices which communicate to NFC-enabled devices such as smartphones, not for installation in the smartphone directly. Google has recently brought attention to NFC applications in smartphones with Google Wallet, a system for transacting mobile payments that will be embedded into the Samsung Nexus-S smartphone, initially on Sprint. Google Wallet users will also be required to have a Citi MasterCard account. TI is competing in an NFC market that was co-founded by NXP Semiconductors (formerly Philips). NXP collaborated with Google to develop the Nexus-S NFC capability. TI’s new TRF7970A NFC development kit is immediately available for order at www.ti.com/nfc-pr-es for USD $99.